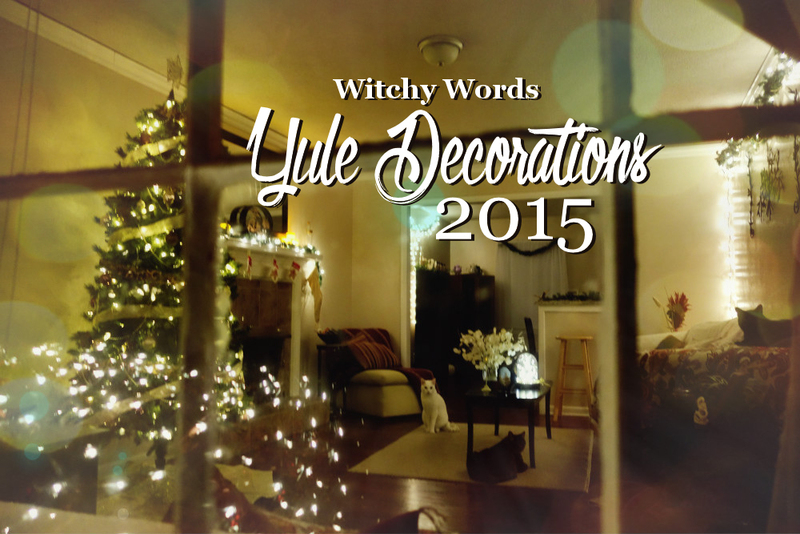 Witchy Words: Terra Luna: Our Home Decorated for Yule! 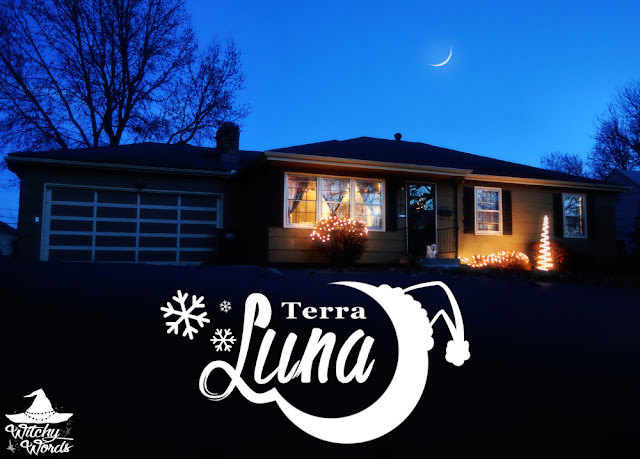 Terra Luna: Our Home Decorated for Yule! Need some music to listen to while you walk through our Yule-decorated home? Try here, here, here and here! This is the first year we've done outdoor lights that weren't just a string of white lights on a railing or window. Look at our little swirling light tree! I'm so proud of it! Our living room! I'm going to switch between day and night photos because I'm in love with the way our new home looks in both lighting. The familiars are loving their new home. You'll see them throughout this post as they worked their way into many of the shots, but they're all four lounging in this one! I want to say before we go any farther that the house came together so much better than I anticipated considering we lost so much in the moves, including both our futon and love seat, two nightstands, our bed frame, a lamp and more. A lot of it got damaged in the process. Some of it was just no good from the beginning. You'll see our new couch above, the one I had intended for the sitting room at the 30 day house. It worked in nicely as the main couch of our living room here! As someone who has moved a lot in the past eight years, I feel like two things designate a sense of nesting or staying: Holiday lights and curtains. We now have both! You'll recognize the accent chairs as items I found at a thrift store for less than $15 a piece in mint condition. The rugs throughout the house were on sale for $17 at a local store - more than half off. We truly didn't spend much to pull it all together. Even our blessing bowl got its own little marble stand for less than $15! Holiday decorations! So it's kind of hard to hang it until those come down. But we thought this centralized location between the dining area and the kitchen and over the stairway into the spiritual room would be a perfect location! Also, take note of this fabulous item right here. When we moved into Terra Luna, we knew the cats would love the half walls everywhere. What we didn't realize is that they'd take to leaping from half wall to half wall over the stairway. One wrong slip, and we could have a broken leg - or worse. This is especially pertinent with our adorable cerebral palsy cat, Apollo (pictured above). When we mentioned this to my husband's parents, my father-in-law, who has a wood work shop in their basement, created this adorable cat bridge for them! They haven't jumped across since! Family station! My husband and I have needed something like this for a long time, so it was the first thing I thought of when I saw this long blank wall with nothing on it. This is going to be super handy! Moving on down our hallway. I had a lot of updates to make to our frames this year with all the amazing photos of Circle of Fountains my husband has taken. That man has zero interest in photography, but picked up a camera and went through a photo 101 lesson with me so he could take better photos for the circle. What an amazing guy I found 12 years ago! A reading room! Eventually, we're going to wall mount that TV. It just didn't happen before the housewarming party. Other than that, I'm super proud of how this came out! Despite buying two totally different chairs, the rug and the curtain really pulls everything together. Very proud! Before I go on to the bedroom, I want to say that my husband and I have never had a bedroom we could be proud of. We invested a lot of money in a new mattress and really just left it at that. Sometimes the mattress was just on the floor. Then the bed frame we did get broke. The nightstands were literally my first computer desk sawed in half - and looked it. So I'm really excited to show you what we've accomplished! There's also a tall dresser with a jewelry stand in the corner that you can't see. It still needs some wall dressings, but otherwise, I think this room is pretty done. And I don't feel like I need to close the door on it every time someone visits now! Look, ma. I'm a real adult! Sort of. Our office could use a little work. My husband and I agreed that, if we resign the lease, we're going to buy matching L-shaped desks. Until then, this is better than what we've been doing with the office, so I'm still pretty proud. I mean, heck, the drapes and the rug match. Good enough! I'd show you our master bathroom, but it really doesn't look much different than the last time you saw it when I did a walk through with no furniture. I mean, it has a plant and utensils and a mat but it's.. a bathroom, you know? However, our front bathroom is a different story! Look at all those things that match the vessel sink! The spiritual room! That's all you get to see of it here (oh look, here I go again with teasing). I took a ton of pictures of it that night, so expect a post about it in the near future! Our theater and game room! Yep, we have a theater now. It's a little sparse, but it'll grow the longer we stay here. I'm so excited! And there you have it! Both a full walkthrough of our wonderful little home and our decorations for the holiday season! I hope everyone's decorating went or is going as smoothly as ours did! Looking good! You've completely covered the house. Haha! I love it. We just decorated the library and kitchen. Our house is still mostly packed in boxes and have been since we moved in August. Putting in new floors soon. Waiting for hunting season to slow so my dad will actually be around l. Haha! I understand that one! At the 30 day house, we never unpacked because we were planning on doing renovations. I never had a chance to decorate for Mabon/fall with everything going on and I sorely missed it. 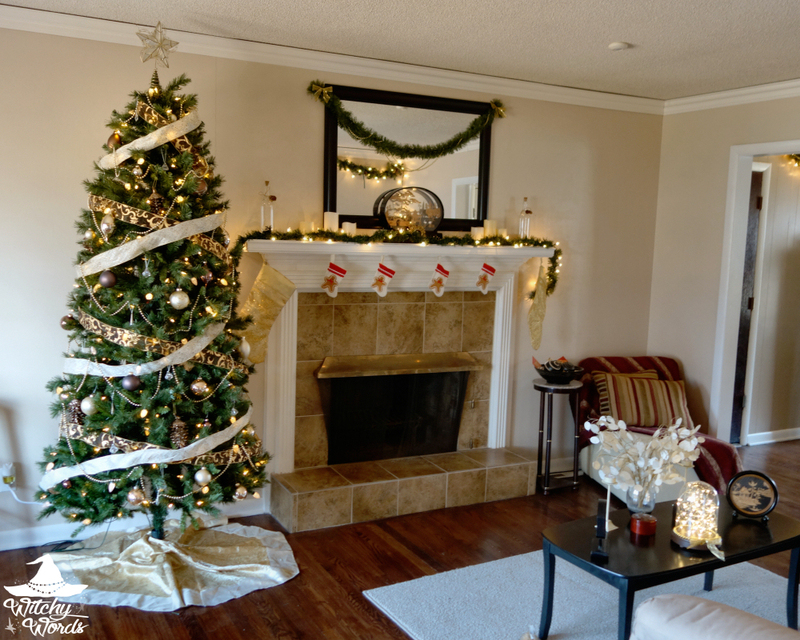 This is the first year we've gone all out house-wide for Yule decorations and I'm loving it! Wow, what a great looking house. I wish I had that kind of touch as I truly don't have any artistic talent :P.
Aw, thank you so much! Honestly, we got really lucky that everything came together considering our budget and locations to shop. I'm so thrilled with how it looks! It finally feels like home! It's such a wonderful, cozy, inviting home! And such an inspiration for me now that I 'm moving too! lol I completely understand! Thank you so much! Of course! Thank you for your kind words! Everything looks nice! I love the reading room and the spiritual room--two things I wish I had. I'm glad you guys were able to settle in so nicely! Hey you could almost be an interior designer! Thank you so much, Liz! I'm so glad that everything came together the way it did considering our budget. I'm ready to spend the winter hibernating in our new home. At least it actually feels like home this time! Thank you so much! Here's hoping we stay longer than a year (or 10 months, though we've officially beat 30 days, ha!). What a warm, inviting, lovely space! Just beautiful. Thank you so much, Sarah! I truly appreciate it!